Don't fancy paying for ringtones and want to create your own ones instead? 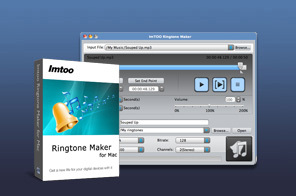 ImTOO Ringtone Maker for Mac is the perfect solution. Using this powerful ringtone converter for Mac, you can convert popular video and audio format files including AVI, MPEG, WMV, DivX, MP4, H.264/AVC, MKV, RM, MOV, MP3, WMA, WAV, RA, M4A, AAC, AC3, OGG and so on to ringtones on Mac OS. In addition, you can also trim any part of a media file and make it your ringtone, create ringtone fade-in and fade-out effects, and create ringtones with millisecond precision. ImTOO Ringtone Maker for Mac offers by far the easiest and fastest way to create mobile ringtones for nearly all mobile phones brands and models such as iPhone, Nokia, Motorola, Gphone, BlackBerry, Sony Ericsson, Samsung, HTC and LG. Download ImTOO Ringtone Maker for Mac FREE now! Create ringtones from popular audio formats including MP3, WMA, WAV, RA, M4A, AAC, AC3, and OGG. Extract audio from popular video formats including AVI, MPEG, WMV, DivX, MP4, H.264/AVC, MKV, RM, and MOV, and turn them into ringtones. Clipped segment from video/audio file and make it into a ringtone. Add fade-in/fade-out effects to the beginning/end of ringtones. Import files to application by a simple means of drag-and-drop. Play media file, clipped segment and the output ringtones with applied fade-in/out effects with the built-in player. Ability to create ringtones to millisecond precision. Adjust bit rate, sample rate, audio channel, and ringtone volume to create customized ringtones. Multilingual interface in English, German, French, Spanish, Simplified Chinese, Traditional Chinese and Japanese. Mobile phones: Nokia, Motorola, iPhone, iPhone 3GS, iPhone 4, Gphone, Sony Ericsson, BlackBerry, LG, Samsung, HTC, iPad Wi-Fi, iPad Wi-Fi+3G, iPad 16GB, iPad 32GB, iPad 64GB, iPad2, New iPad, iPad mini, iPad mini with Retina display.